The offices of Zynga, Pinterest, AirBnB and other companies in San Francisco's South of Market District were under lockdown Friday after a shooting at a nearby store located in the same building as AirBnB's headquarters. 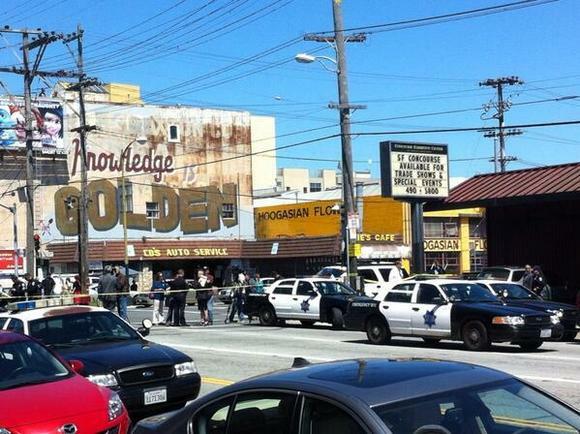 Two people were killed and one was injured in the incident at a jewelry store at 888 Brannan St. at about 2 p.m. local time Friday, according to local news reports. The suspect emerged from the store "covered in blood" and fired at police before he apparently ran out of ammunition and surrendered, the San Jose Mercury News reported. No police were injured and no motive had been determined, the paper said. The jewelry store, near the corner of 8th and Brannan streets, is in the basement of a large building that's also the site of AirBnB's new headquarters a few floors up. That part of SOMA is also home to a cluster of tech firms that have sprung up over the past few years, including Zynga, which is a block away on 8th and Townsend, Pinterest and Yammer, which is a few blocks up the street. Several employees at the companies said on Twitter they were told not to leave their building for their own safety. Traffic was backed up for several blocks on adjacent streets and a police helicopter circled for most of the afternoon, but police reportedly think the suspect acted alone. "For Zyngites safety, Security has a lock down on our building. Until Security receives clearance from SFPD the building will remain on lockdown and exiting will be restricted," Zynga employees were told via email on Friday, according to a screenshot posted to Twitter by an employee. AirBnB, Zynga and Pinterest didn't immediately respond to requests for comment.